Turn ON the switch at the right side wall of the chiller housing. At that time controller window will show the temperature (This is the present temperature). Push the set button. Push p (to increased temperature) or q (to decrease temperature) button to set your desired temperature. Setting had been done. Then wait for a while. 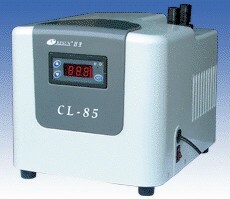 The present water temperature will be shown automatically. Push set button for 10 second. If you want to check the setting temperature, push set button once. Your setting temperature will be shown at the window of controller. Shift between chilling and heating mod is required the time interval of 2 minutes.